A story in Bengali was sent to BBC News app users and Twitter followers because of human error, the corporation has said. The article was about a police raid on militants in Dhaka. A BBC spokesman said it had been sent by mistake by a World Service reporter and was taken down minutes later. He added: "It was literally a human error and it has been corrected." 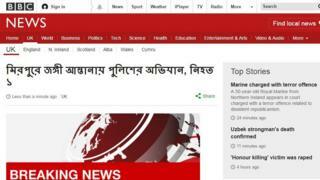 The BBC later tweeted: "Apologies to anyone who received a breaking news alert from our Bengali service. Don't worry, we weren't hacked".